Construct it well. Design techniques vary with location, so hire an excavator who understands ponds. He will know to build it using sharply sloping banks to control aquatic weeds, for instance. Have the soil type tested to be sure enough clay content is present to seal the pond's bottom (IMAS can help here, call on 01462 734797). It is common place for you to move into a house with an existing pond. Sometimes people leave a blow by blow account of what to do and what to expect and some people leave nothing. This is often problematic if you have no experience of pond keeping and have a lot of fish that are reliant upon your support. Don�t worry we are able to help. We are able to visit you and will assess your specific situation. 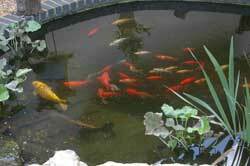 We will provide you with a broad over view of your pond, allowing you to understand what you have and how to manage it. Our main objective is to enable you to move confidently forward with your new pond, we are happy to provide as much information as you can digest. However we wouldn�t want to over complicate the situation. So we would record your pond details, capacity, type, equipment etc. and should you need any further support as you start to live with your pond we are just at the end of a phone. The cost of this service starts at �45 (+vat), to get an accurate quote and organise please either call or mail.